The songs are stored in the database. We’re using the while loop together with the mysqli_fetch_assoc() function to pull it from the database. 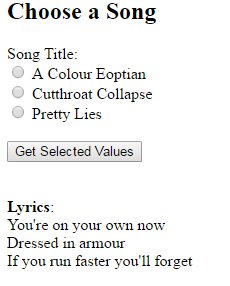 It goes through all the info in the table and posts only the Song Title. It’s then hooked up to the if(isset($_POST[‘radio’])) to display whatever is inside of the input’s “value” section. 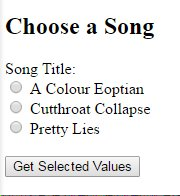 Which, in our case, is the lyrics of whatever song we chose. That’s pretty much everything we have for the plugin so far. Next up: getting the Add a New Song feature to work.